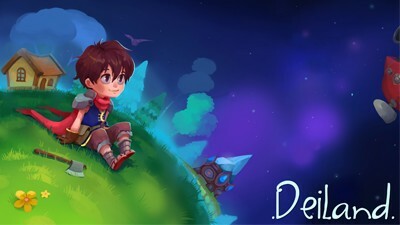 If you are having trouble advancing your wishes like How to get Cotton, or How to get more Metal and Seeds then, here's a simple guide on how to survive in the adventure mobile game Deiland. - This is the story of Arco, the youngest of the princes who inhabited the smallest of the minor planets: Deiland, the Tiny. In order to survive this empty little planet you need to follow and complete the main quests of the game, to unlock more wishes, materials, tools, and more. - Tools can be crafted and upgraded from your Home. Tap on them to check the crafting materials needed. - To till the fields and plant seeds, also used to harvest crops. - For getting firewood from trees. - Used to clear out nearby enemies, just "tap" on enemies to let your character defeat them. - Use the Hammer to break stones and find metal and minerals. To break and harvest crystals, you need a Lvl 2 Hammer. If you want to speed up your game, upgrade your hammer asap! - For building and upgrading structures, or used to destroy campfires or wells. - Can also be used to defeat enemies. - The torch is lit by approaching it to the campfires. - Used to gather wood fast, refer to the "Faster Way to Earn Wood" section below for more info. - Can also be used to defeat enemies, but the damage is minuscule (might be useful for certain type of monsters though). - Never use this on your crops, it will burn them too! - Used for fishing in the lake. - Note: The Thread item can be found under the Derivated Materials, it is on the next page, after the Tools page in your Home. - Useful for casting spells into enemies that are vulnerable from magic attacks, or when your HP is low and you need to defeat more monsters. - Upgrade to unlock more spells (each spell will require crystals to cast). - Optional weapon item, only available from the SHOP. - Crops are mainly used for trading, harvest and sell them to Brram the merchant chef. Never Run Out Of Seeds! - Always reserve at least 1 seed per crop just in case you accidentally burned all your crops or trees...or if you are unlucky, a Meteor might also hit them. - Gather them from trees. - Buy them from Braam the chef, in case you run out of seeds. - Can be obtained from the Meteors' crystals. Use Hammer 2 or better to harvest them. - Use to increase the growth speed of your crops or trees. Build them near your fields to save time. - Use to put out camp fires. - Can be used to defeat certain monsters like the fire demons. - You can control the planet by using "tap+hold" to move the rain where you want it. - Just enough to make your plants shiny, then move to your other crops or trees. - Letting the rain fall into your well will refill the number of times that you can get water. - To lit up your torch and burn trees or monsters that are vulnerable to fire. - First, plant and stack them in one place, yup just keep planting without moving. Next, wait for them to fully grow. Optional: You can also harvest their seeds first, and only burn them if you need wood. - Lit up your camp fire and use your torch. - Now this is tricky, tap on the fully grown trees then quickly move away once the fire starts! - Before collecting the wood, equip any tool first to move your torch away. - Repeat steps for the remaining tree stomps to get more wood. - Pros: Faster since there are no cool-downs. - Cons: Can be fatal if not done right~ XD. - I tried planting them over the camp fire then putting up a fire...didn't work haha!. - It is also possible to survive the cons if you have enough Stamina stats. Watch Out for that Meteor! - If a meteor is coming, an icon will appear at the upper right corner of your screen. - This is bad if it lands on your crops or trees (but sometimes it is acceptable to get instant wood too). - To avoid this, control the planet by using "tap+hold" to move your "screen or view" on the other side of the planet or somewhere safe, before it lands. - I recommend that you let it fall on an open space to harvest their crystals later. Try not to let it land on rocks, or other objects the will prevent you from getting the crystals. - Only sell items that can be farmed easily, like crops, wood, seeds, monster loots and more. Keep your hard earned items for later use. - Merchant Brram: Sell seeds, crops, and other ingredients to the chef to get higher rates. - Merchant Mun: Sell monster loots to her to get higher rates. Note that some monster loots are needed for certain things like crafting. - Merchant Lock: Sell your unneeded potions to him. - They randomly pops out around the planet, gather and sell them to merchants for easy money early game. - A material used for crafting Fishing Rods. - Wait for the visitor named Brram the chef, then purchase the Cotton seed from him if it's available. Yes it appears randomly. How to Get More Metal? - Randomly obtained by hammering rocks. This one is your best choice, if your character is idle, go and obtain 5 Metals asap to upgrade your Hammer to Lvl 2. Why?, because Hammer 2 will reduce the cooldown timer to half (10 seconds), and will increase the chances of getting Metal. - With Hammer 2, it is also possible to obtain 2 or 3 Metals in a row. - The Hammer 2 upgrade can be unlocked by upgrading your Home to Lvl 2. - You can also use the "END" option to instantly remove the cooldown of your Hammer while breaking stones. - It will consume Crystals though, but you can obtain them from crystal rocks made by Meteors, or harvest them from those big green-colored rocks. - Buy them from merchant visitors (appears randomly). - Earned through Mining. Metal is common here but it has a very long cool-down. - Watching some video ads or buying it from the shop (optional, must be online). How to Melt Silver Stones into Silver Bars? - Upgrade your House until you are able to unlock the recipe for the Gold and Silver Bars under the Derivated Materials tab. - So, keep and do not sell your Silver and Gold Stones for later. - Once you are able to buy or get some Silver Bars, use them first to upgrade your Hammer. Smashing rocks will only now take 6 seconds, farm more Metals then boost your House. How to Unlock the Mine? - You need to finish 20 Wishes first to unlock (under Hammer's construct option). - Requires 20 Wood and 10 Metals. Updates: More Gameplay Info and Pics!